Have you ever started a communications campaign and realised that you weren’t exactly sure what you were trying to achieve? You get so wrapped up in the ‘doing’ that you don’t spend time thinking about the WHY. As Simon Sinek talks about in his book, ‘"Start with Why," we need to always start by asking the important question WHY. “Knowing your WHY is not the only way to be successful, but it is the only way to maintain a long lasting success and have a greater blend of innovation and flexibility,” he says. And isn’t this what we’re trying to achieve with our communications campaign, long lasting success and IMPACT? When you start a communications campaign with tactics, versus setting goals, you’re more likely to fail. 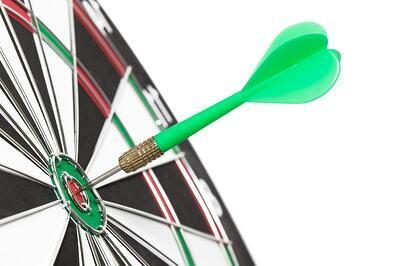 Picture a dart board, with the different sections having different point values. Doesn’t this help you decide where to aim? That’s exactly what objectives do for you, giving you clarity on where to focus and aim your time and attention. Without them, just like with darts, you could be going (or throwing) in the wrong direction and at the wrong targets! This focus will also help as you deal with the inevitable obstacles you’ll need to overcome throughout your campaign. For example, let’s say you’re launching a new recognition platform, and a week before the launch event you discover that one of your offices cannot participate due to a business priority. How do you decide what to do? If you had set an objective that your communications would have ‘one voice to the entire company’ then you would know to reschedule the event, as you wouldn’t want to communicate to different parts of the business at different times. One of the ways we resolve the issues mentioned in the previous point is through flexibility. Flexibility helps us be agile and prepared to change our direction. If I think back to my days as a gymnast, all those hours of working on flexibility helped to not only perform the tricks but make sure that I could handle when things went wrong and I was flying through the air trying to figure out how to land safely. It’s the same with your communications campaign, where you may need to make changes based on timings, budgets, etc. Last but (definitely!) not least, objectives help us define success. This is absolutely critical in the data-driven world that we live in, where we need to use data to prove the effectiveness and return-on-investment of our HR programmes. Our objectives can, and should, help us define what the end looks like and how we achieve it successfully. Without them, we won’t be able to picture this success. And without knowing what success looks like, we can’t celebrate our achievements. Which, let’s be honest, is the icing on the cake of any communications campaign! Not sure how to create these objectives? We'll tackle that in my next blog.